I’m Dave Collins with cleverhiker.com and in this episode we’re going to take a look at staying safe in lightning storms and when hiking at high elevations. Hiking in beautiful locations can often come with unavoidable tradeoffs. Backpacking above tree line will give you fantastic sweeping views, but you’ll also be much more exposed. Lightning safety and high elevation hiking safety are two key skills that often go hand in hand. Learning how to safely navigate these dangers will lead to rewarding trips in breathtaking locations. Lightning can be exciting and beautiful if viewed from a safe distance, but if you leave yourself exposed, you could be putting yourself in an unnecessarily dangerous situation. In North America there are currently around 530 million people and only an average of about 60 lightning fatalities per year. In the rare event that you are struck by lightning, there’s only a 10% that the strike will be fatal. So, if you take the proper precautions, you’re probably going to be just fine. The first step in lightning safety is to be prepared. Check weather forecasts before your trip and know the weather patterns of the area where you’ll be traveling. In the mountains, lightning storms are common in the afternoon, so get an early start and make sure you won’t be in an exposed area early in the early afternoon when storms are likely to form. Pay close attention to the weather while you hike and watch for any aggressive cloud formations. You’ll often be able to see the weather coming before it gets to you, so stay alert. Look for flashes of lightning in distant clouds and listen for thunder. If you can see lightning and hear thunder, it’s probably a good idea to head for shelter. Get a rough estimate of a storm’s distance by counting the seconds after you see a lightning strike until you hear the thunder. The storm is 1 mile away for every 5 seconds you count, or 1 kilometer for every 3 seconds. In general, if you counted less than 30 seconds, you should already be in your shelter. Lightning strikes are not completely predictable, so minimizing your chances of getting hit by lightning is really the most important consideration. On the trail, you won’t be able to seek shelter in a large enclosed building, like a house, which is generally the best place to take shelter. If you’re by a trailhead, you could take shelter in your car, which is a safe place to be. Roll up all the windows and don’t touch any metal inside your car. Never seek shelter in open structures like picnic pavilions or shallow caves. They won’t protect you from a lightning strike and they may even attract lightning. When you’re out on the trail during a lightning storm, avoid high elevations. Come down from exposed areas and try to find low spots, like a valleys or depressions in the terrain. Take shelter in a low stand of trees and avoid touching any tree trunks. Never seek a dry shelter under a lone tall tree. That’s just about the most dangerous place you could be. Height, a pointy shape, and isolation are the main factors for attracting lightning, so it’s always better to be wet and safe than dry and in danger. Take off your backpack and leave it to the side while the storm is near. Metal doesn’t attract lightning, but it does conduct it. The same goes for your hiking poles. If you are in a group, spread out to avoid multiple injuries if lightning strikes nearby. Each person should be about 100 feet apart and you should yell out to each group member after every nearby strike. If you’re still feeling exposed, you should take the lightning crouch position to limit your exposure. Crouch down to minimize your height and stand on the balls of your feet to limit your contact with the ground. Put your hands over your ears, close your eyes, and put your head in-between your knees. That will minimize the damage if you do get struck by lightning. If lightning is about to strike nearby, you might feel it before it happens. Your hair might stand on end and you might start to feel a slight tingling on your skin. If you can detect a strike coming, get into the couch position immediately. If someone in your group is struck by lightning, get emergency medical help as soon as possible. A person that has been struck by lightning is safe to touch, there is no electric charge remaining. Check the victim for breathing and heartbeat. If there is no breathing or heartbeat, start CPR immediately. If more than one person has been struck, treat those who are unconscious first. They are at greatest risk of dying. Also, it’s important to keep in mind that there is still danger of another strike, so only gather in groups as necessary. There are other health complications that can arise from lightning strikes like burns and shock, but the main cause of death is cardiac arrest, so CPR is the most important treatment. Lightning and backpacking at high elevations can often go hand in hand. Storms can roll in very quickly when you’re hiking in the mountains, so being prepared is very important. High elevation hiking can lead to huge views and rewarding summits. But before you plan a high elevation trip, make sure you’re prepared for the dangers associated with altitudes. Any hike above 8,000 feet (2,500 meters) should be considered high elevation, and you could feel the effects. The higher you climb, the more risks you’re going to encounter. Air pressure is lower at high elevations, which means that you’ll be getting less oxygen with every breath. Your body will have to work harder and you will likely notice the effects of altitude, especially on big climbs. It’ll also be colder at high elevations. Every 1,000 feet that you gain will lower the average temperature by about 3.5 degrees. Sun exposure is more intense at high elevation. Make sure to use sunscreen, bring a hat, wear a pair of UV sunglasses, and use lip balm with UV sun protection. Staying well hydrated is another key concern when you’re hiking at high elevation. Increased sun exposure will drain your body of fluids quicker and staying hydrated will reduce some symptoms of hiking at altitude. Some symptoms of high altitude sickness can’t be avoided by training, but being in peak physical condition is imperative when hiking at altitude. Being in good shape will make a world of difference when your body is getting a lot less oxygen. Slowing your pace can help your body to use energy more efficiently at high elevations. Maintaining deep, even breathing and try not to over exert yourself. Some people will experience altitude sickness when they hike at high altitudes and others may not. It’s not something you can’t prepare for, it just happens to some people and doesn’t to others. Symptoms can be as subtle as slight headaches or trouble sleeping, and they can be as severe as high altitude edemas, which can be fatal. So don’t take high altitude sickness lightly. 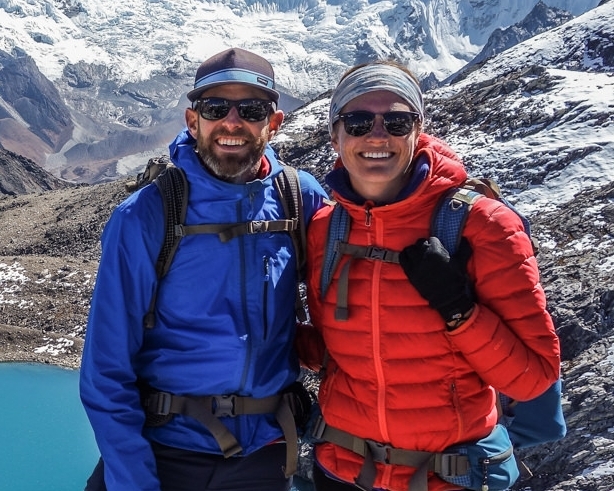 Acclimatization is key to avoiding altitude sickness on high trails. It’s never a good idea to drive from a low elevation to a high elevation hiking area and hop out of your car to go for a strenuous hike. Instead, ease into your trip and let your body adjust. Acute Mountain Sickness, is the most common way that hikers feel the negative effects of high elevations. Symptoms of AMS include headache, dizziness, fatigue, nausea, and shortness of breath. In advanced stages, hikers might feel disoriented or confused and start to stagger. If symptoms are mild, you can rest at the same elevation for a few hours until you start to feel better, but it’s never a good idea to just push through the pain and hike higher. Ignoring high altitude sickness symptoms can lead to High Altitude Pulminary & Cerebral Edimas, which is an excess of fluid in your lungs or brain. Both of these conditions will lead to impaired judgment and can be incredibly deadly, so don’t play around with altitude sickness. The only sure cure for Acute Mountain Sickness is to descend, so pay close attention to symptoms and don’t wait until it’s too late to take action. The biggest problems with altitude generally occur when people get summit fever – they keep hiking to reach their goal without listening to their bodies. If you’re taking a trip into high elevation, you need to be willing to turn back when something isn’t right. That’s a commitment that you need to make before you even leave the trailhead. One of the most important skills you’ll ever develop when hiking at high elevations is knowing when to stop and turn back, no matter how close you might be to the summit. The mountains will always be there, but if you’re too stubborn, you might not. So take the correct precautions, pay close attention to your body, and make smart choices. Follow those rules and you’re sure to have a safe and amazing trip. I’m Dave Collins with cleverhiker.com, hike light, hike smart, and have fun.